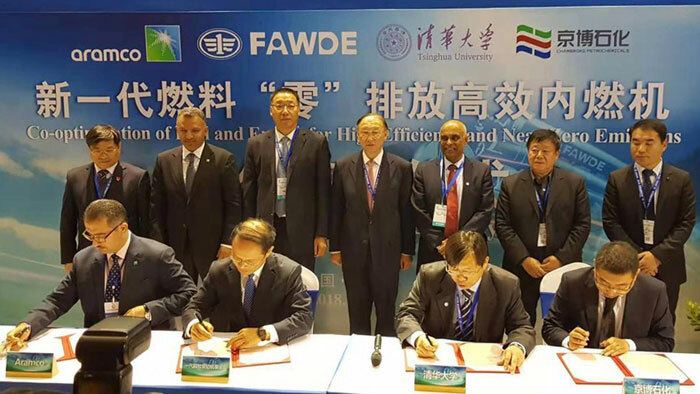 Saudi Aramco and Chinese entities Tsinghua University, FAW Jiefang Automotive Wuxi Diesel Works (FAWDE), and Shandong Chambroad Petrochemicals Company announced the start of a research program dedicated to fuel and engine optimization, and exhaust after-treatment technologies. For the first time a major energy company, engine manufacturer, petrochemicals company, and a renowned university come together to develop advanced fuel and engine technologies to reduce emissions. Chambroad Petrochemical will conduct refinery modelling, techno-economic analysis, and produce new fuels for testing. FAWDE will provide prototype engines and after-treatment systems, as well as conduct system integration and vehicle demonstration. This collaboration aligns with the partners’ strategic intent to create solutions for CO2 reduction taking total emissions into consideration, while delivering efficient, reliable engine and fuels performance.